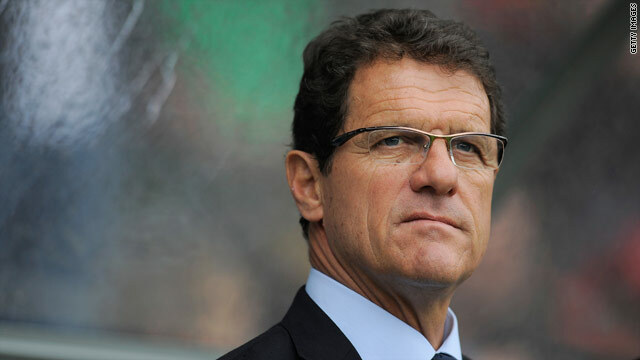 Fabio Capello watches on as his team score an unconvincing win over Japan in Graz. (CNN) -- England came from behind to win 2-1 but needed two own goals from Japan defenders to scramble to victory in their World Cup warm-up match in Graz on Sunday. It was hardly the ideal preparation for the South Africa finals and few fringe players pressed their claims for a place in Fabio Capello's final 23 which will be announced on Tuesday. Marcus 'Tulio' Tanaka put Japan ahead after six minutes in Austria but then turned the ball into his own net in the second half as England equalized. The winner came via the same route with Yuji Nakazawa the unfortunate defender. Capello admitted that the first-half had been poor for his side and he was forced to make wholesale changes for the second, with Chelsea's Joe Cole pressing his claims by having a hand in both goals. "The first-half we were too slow, and allowed them to outpace us and create more than we did," the Italian told ITV Sport. "In the second we had more pace and more creativity and gave the Japanese more of a match and stopped them from playing." Japan went into the friendly on a run of three defeats in four games but it hardly showed with a fine performance on a pitch made greasy by steady rain. They were ahead early as Liverpool's Glen Johnson failed to close down Tulio who scored from a Yasuhito Endo corner. England could create little in reply with the best effort coming from Aaron Lennon, but the Tottenham man's shot was well saved by Eiji Kawashima. At the other end, England captain Rio Ferdinand slipped but Shinji Okazaki wasted the opportunity to shoot over. Capello made five changes at halftime, bringing on Joe Cole, Shaun Wright-Phillips, Jamie Carragher, Joe Hart and Steven Gerrard and adopting a different 4-5-1 formation with Wayne Rooney the sole striker. Frank Lampard earned England a penalty as Honda handled the Chelsea's man's free kick. But Lampard's 55th minute spotkick was saved by Kawashima, the second time in a row he has missed a penalty after shooting tamely wide in his club's FA Cup win against Portsmouth. Japan substitute Daiki Iwamasa saw Hart deny him with a fine stop just after the hour mark and Rooney was twice prevented from scoring by excellent saves from Kawashima. Japanese looked set to hold on for a famous victory until Cole's near-post cross was headed into his own net after 71 minutes by Tulio. Then 10 minutes later Cole fed Ashley Cole and down the left and the Chelsea left-back's cross was turned into his own net by a sliding Nakazawa, sealing Japan's fate. Hart still had to be alert to save smartly from Makoto Hasebe and watched as Ujki Abe headed against the top of the crossbar as England held on for an uneasy win. Germany defender Heiko Westermann became their latest World Cup casualty, as he will miss the finals with a broken foot. The 27-year-old Schalke 04 player injured himself during Germany's 3-0 friendly win over Hungary in Budapest on Saturday and he follows captain Michael Ballack and midfielder Christian Traesch in having to pull out. Fit-again William Gallas scored a second half equalizer, as France fought back to salvage a 1-1 draw in Tunisia. Gallas converted from Yoann Gourcuff's second-half free-kick as Les Bleus struck after conceding an early opener to Issam Jemaa.